Today was supposed to be an easy day. I was telecommuting. I began my day at waking up at the usual time, instead of commuting to work, I went swimming. I got back home for 9 am and got to work. I was a maniac, getting everything I needed done. My to do list was completely checked off by 1:30. So what did I do? I started on tomorrow’s to do list. I had an appointment scheduled that I knew would get in the way of those tasks, so I thought I’d start them. Task 1: Back up both Macintosh servers. Task 3: Download and install Server.app version 3, and follow prompts to migrate server settings. Server.app is great for a central location to manage your OS X server, but when something goes wrong… like this… there’s no information. I hate you, Apple. I will make a Mountain Lion install USB drive. Boot into that, and pull up Disk Utility. From there I’ll use Time Machine to restore the Backup drive to OSHD_Use. 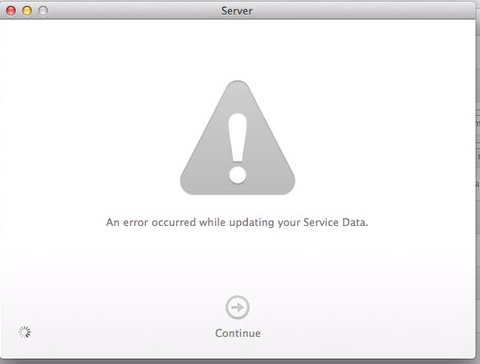 After that, install Mavericks (10.9) once again, and download Server.app 3, and try again. And hoorah! It worked! Took me about five hours, but it worked. Next to the South Campus, where after I started the Mavericks install, it just won’t come back up on Remote Desktop (ARD3). Sigh. I went to the South Campus, and found that it had an error message of a failed install. I rebooted the server, and it took me to the generic 10.9 create an admin account screen. I went to get a Firewire 800 cable, booted in target disk mode, confirmed that the files were still stored there, confirmed the latest Time Machine Backup was there, rebooted and told it to recover from Time Machine. It’s now ten to 10pm, so I’m gonna go home and check on this in the morning.